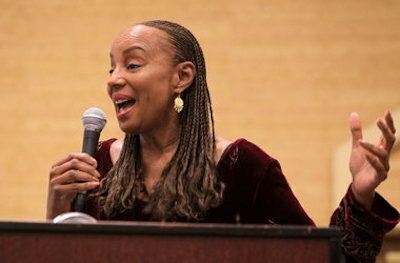 Susan L. Taylor, born January 23, 1946, is an award-winning American editor, journalist, writer, and activist. Raised by her Trinidadian mother and her father from St. Kitts, Taylor grew up in East Harlem, New York, where her father owned a clothing store. Taylor attended Catholic school and moved with her family to Queens Borough, New York, in her teens. Taylor began her career as a freelance fashion and beauty editor for Essence, a lifestyle magazine dedicated to African American women, in 1970, the same year the magazine was founded. At the time, she was a divorced single mother without a college degree. During the 1980s, she attended night school, earning a B.A. from Fordham University. In 1981 Taylor became editor-in-chief of Essence, a position she held until 2000 before being promoted to publications director. Taylor also held the executive producer and host position of the Essence television interview program, syndicated and broadcast on more than fifty stations that ran for years during the 1980s. In the 1990s, “In the Spirit,” Taylor’s monthly inspirational column, became a popular feature in Essence, leading the magazine’s readership to soar to eight million in the United States, Canada, the Caribbean, and the United Kingdom. Taylor also expanded the Essence brand to include book publishing, broadcasting, clothing, and makeup. In 1994 the magazine launched the Essence Music Festival, known for its famous empowerment seminars. Taylor is the editor of eight books and the author of four: the bestseller In the Spirit Lessons in Living; Conformation: The Spiritual Wisdom That Has Shaped Our Lives, which she co-authored with her husband, Khephra Burns; and her most recent book, All About Love. In 1994 Taylor was named “the most influential black woman in journalism” by American Libraries. The Magazine Publishers of America gave Taylor its Henry Johnson Fisher Award, one of the industry’s highest honors, in 1998. She was the first African-American woman to receive the award. In 2002 she was inducted into the American Society of Magazine Editors’ Hall of Fame for her work at Essence. She received the NAACP’s President’s Award in 2006, and in the summer of 2013 was inducted as an honorary member of the Delta Sigma Theta sorority, alongside longtime American actress, Angela Bassett. In 2008 after twenty-seven years as the editor of Essence, Taylor retired from publishing to develop the National CARES Mentoring Movement to break the cycle of intergeneration poverty among African Americans. Devoted to increasing African American graduation rates and combating the over-incarceration rate of black youth in America today, local CARES Affiliates recruit, train, and deploy caring adults to a wide variety of youth-serving organizations and schools as mentors, tutors, reading buddies, and role models in fifty-eight U.S cities. To date, National CARES has recruited more than one hundred and thirty thousand mentors. In 2009 Taylor formed a brain trust of nationally renowned educators, business and faith leaders, psychologists, physicians, nutritionists, and community activists to bring the best thinkers together to help African Americans improve wellness in body, mind, and spirit. The outcome was A New Way Forward: Healing What’s Hurting Black America, an initiative and training manual for mentoring the young and healing African American communities.